Judging from Mirziyoyev’s travel plans, Uzbekistan’s ambitions remain high and its circles of engagement are widening. Uzbek President Shavkat Mirziyoyev continues his press to gin up interest and investment for Uzbekistan, earlier this week traveling to the United Arab Emirates where $10 billion in deals were signed. The trip was his third foreign jaunt this year and underscored the broadening global circle where Uzbekistan is looking for engagement. According to the Uzbek president’s office, the agreements signed between the UAE and Uzbekistan stretched across a host of areas from investment and finance to renewable energy, infrastructure development, and agriculture. Mirziyoyev met with Crown Prince Sheikh Mohammed bin Zayed Al Nahyan and an array of other UAE officials, while his ministers held meetings with their counterparts. One notable connection was made between CEO and managing director of the Mubadala Investment Company Khaldoon Al Mubarak and Sardor Umurzakov, Uzbekistan’s minister of investments and foreign trade. The two signed an agreement focused on both conventional energy and renewables. 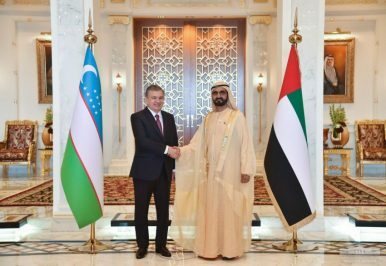 While Uzbekistan and the UAE have had diplomatic relations since 1992, the Uzbek president’s office statement on the recent visit noted that “For the first time in the history of bilateral relations” an ambassador from Uzbekistan had been appointed and sent to the UAE. In February, Bakhtiyor Ibrahimov was appointed ambassador and in early March he arrived in Abu Dhabi. The UAE trip underscores Mirziyoyev’s widening global circle. In the first year of his presidency, Mirziyoyev concentrated his travels on Uzbekistan’s neighbors and core partners. His first foreign trip was to Turkmenistan in March 2017 and his favorite destination was Kazakhstan, with four visits in that year alone. Mirziyoyev also traveled to Beijing in 2017 to attend the Belt and Road Forum, Saudi Arabia to attend the Arab Islamic American summit, and the United States to attend the UN General Assembly. He made three trips to Russia in 2017, and important state visits to Kyrgyzstan, Turkey, and South Korea. In 2018, Mirziyoyev followed much of the same pattern, albeit with fewer trips overall (16 in 2017 vs. 13 in 2018). That said, a number of his 2018 visits were advertised as historic: a state visit to Tajikistan, a similarly notable state visit to Washington, D.C., and trips to the capitals of India and France. In 2019, Mirziyoyev’s itineraries have broadened, mirroring both the continued march of his reform program and also a need to solicit investment and interest from as broad a range as possible. According to Uzbek media, Mirziyoyev plans to make 36 foreign trips in 2019. Prior to the recent UAE visit, Mirziyoyev traveled to the Indian state of Gujarat in January for a working visit. In Gujarat — where current Indian Prime Minister Narendra Modi served as chief minister — Mirziyoyev attended the Vibrant Gujarat Global Summit, a biennial investors summit. The working visit built upon Mirziyoyev’s state visit to the Indian capital in late September 2018. Among the agreements signed during the 2018 visit was an MoU on cooperation between the state of Gujarat and Andijan region. Included in the Uzbek delegation to Gujarat was the governor of Andijan, demonstrating the opening notes of an operationalization of the MoU. Also in January, though before Mirziyoyev’s working visit to Gujarat, Uzbekistan hosted what was billed as the “first India-Central Asia Dialogue” in Samarkand. Co-chaired by Indian Minister of External Affairs Sushma Swaraj and Uzbek Foreign Minister Abdulaziz Kamilov, the foreign ministers of Afghanistan, Kyrgyzstan, Tajikistan, and Turkmenistan as well as the first deputy foreign minister of Kazakhstan participated. Another key trip this year for Mirziyoyev was a state visit to Germany in late January. On the docket for 2019 so far is a planned visit to Belgium, specifically targeting the European Union. In February, Uzbekistan and the EU held their first round of negotiations on an Enhanced Partnership and Cooperation Agreement (EPCA) in Tashkent. While those negotiations are in the opening phase — for context, it took Kazakhstan four years to complete the process and sign an EPCA with the EU — Uzbekistan is keen to see them through. Other planned trips include Switzerland, Canada, Japan, Bulgaria, and Belarus. We also can expect regional trips, though those require less advance notice. The next Shanghai Cooperation Organization (SCO) summit is slated for June in Bishkek, Kyrgyzstan and next month the five Central Asian leaders are supposed to be gathering in Tashkent for their second summit (last year they met in Astana). Another possible destination is Beijing, which will host the second Belt and Road Forum in late April, although it’s not clear as of writing if Mirziyoyev plans to attend. In sum: Judging from Mirziyoyev’s travel plans, Uzbekistan’s ambitions remain high and the country will increasingly look to widen its circles of engagement. These trips, the quickening pace and broadening reach, reflect not just Uzbek ambition but also global acceptance of Mirziyoyev’s reform efforts. The state Islam Karimov made a pariah to some is continuing its march back into the international system behind Mirziyoyev’s banner. Mirziyoyev and Putin signed investments deals worth $12 billion and trade contracts worth $3.8 billion.